I love to make Greek food, especially when we have friends for dinner. This tabbouleh recipe was given to me by a friends mother. It’s really delicious and healthy. I love to serve it with grilled chicken, hummus and warm pita. If you want a feast, make a big greek salad to go along with it (don’t forget the anchovies). Your friends and family will love it and they’ll be very impressed. It all looks so colorful and pretty when it’s served together at the table. Place the bulgur wheat and salt in a large bowl and pour over the boiling water. Give a quick stir and cover with plastic wrap. Let it sit for about 30 min or until the water is absorbed. Meanwhile, chop the parsley, mint and the garlic. 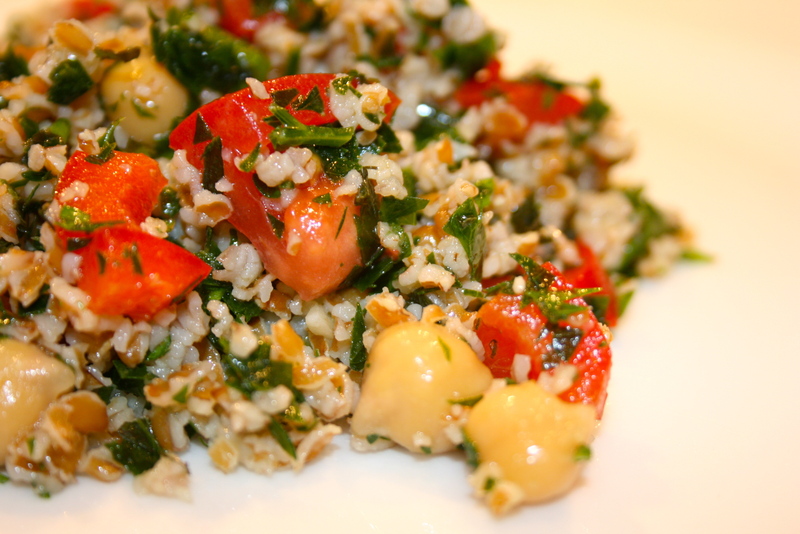 Once the bulgur is ready, stir in the parsley, mint, garlic, lemon juice and olive oil – refrigerate for 2-3 hours. This allows the bulgur to absorb all those fresh flavors. Before serving, toss the chopped veggies & chick peas in with the bulgur mixture. Give it a really good stir and re-season with salt and pepper as needed. Serve. ** This recipe doubles nicely and is great to make for a crowd.